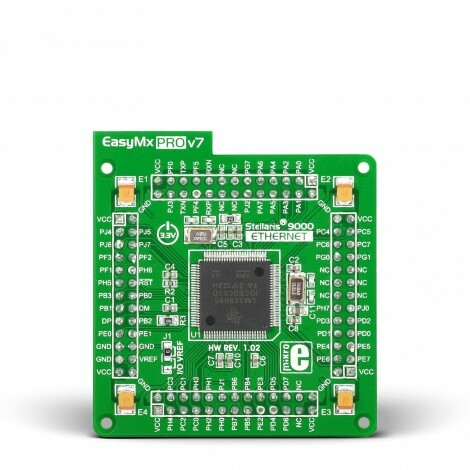 LM3S9B95 is the default chip of EasyMx PRO™ v7 for Stellaris®. It belongs to ARM® Cortex™-M3 family. It has 80MHz operation, 256K bytes of linear program memory, 96K bytes of linear data memory. LM3S9B95 is the default chip of EasyMx PRO™ v7 for Stellaris®. It belongs to ARM® Cortex™-M3 family. It has 80MHz operation, 256K bytes of linear program memory, 96K bytes of linear data memory. It has integrated Ethernet controller with PHY, USB (OTG, Host, Device), up to 65 General purpose I/O pins, five 16-bit timers, 16 Analog Input pins (AD), three UARTs, internal Real time clock (RTC), a pair of each: I2C, SPI and CAN controllers. It also contains 3 analog comparators, 16 digital comparators. It is pre loaded with StellarisWare® libraries and bootloader in ROM. 8MHz crystal oscillator. We carefully chose the most convenient crystal value that provides clock frequency which can be used directly, or with the PLL multipliers to create higher MCU clock value. 25MHz crystal oscillator. This crystal oscillator is connected to internal Ethernet module. VREF jumper. This jumper determines whether PB6 pin is used as voltage reference for A/D converter, or it is used as general purpose I/O pin. Jumper is soldered to VREF position by default. Please note that if VREF jumper is soldered to I/O position Touch Panel controller will not operate correctly, because it uses voltage from this pin as a reference for A/D conversion.